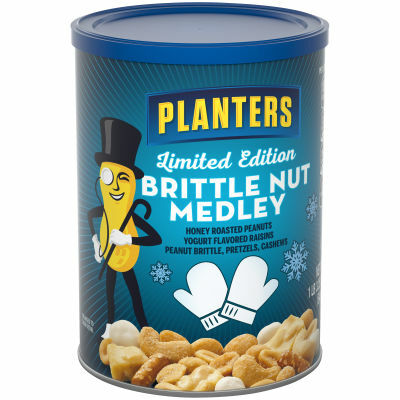 A perfect symphony of flavors is brought together in this limited edition Planters Seasonals Brittle Nut Medley. Featuring honey roasted peanuts, yogurt flavored raisins, peanut brittle, pretzels and cashews, this winter season mixture is sure to warm your heart and your taste buds. Subtle flavors of salty and sweet are enhanced when tasted together in a handful of this brittle mix, which is kosher, trans fat-free and cholesterol-free. Available in a resealable 19.25 oz. can, this exciting medley of snacks can be kept fresh and enjoyed time and time again. Serving size 3 Tbsp. (30g).